Our SLEEP TIDY-SPVs clean your mattresses and upholstered furniture on site, outside the room and building. In an automated 4-step-cleansing process, up to 30 mattresses are cleaned within an hour. Even large establishments are thus cleaned up promptly. Often, a guest’s decision in favor of or against booking a hotel highly depends on the feedback on hygiene standards. Mattresses and upholstered furniture which are filthy and unhygienic can present a serious problem: This can be avoided! Are your guests supposed to expect anything but the best? So that guests don’t have to endure poor conditions! Our unique measurement procedure quantifies for each mattress its own individual condition – so that, after each cleansing, you are absolutely aware of the current status of the sleeping comfort. Determine quality criteria for your establishment and see promptly, which mattresses still meet your standards and which should be replaced. Guarantee each individual customer the highest standard of comfort in their sleep! The SLEEP TIDY Certificate as decisive factor. Our certification guarantees credibility for the high hygienic standards of our partners. 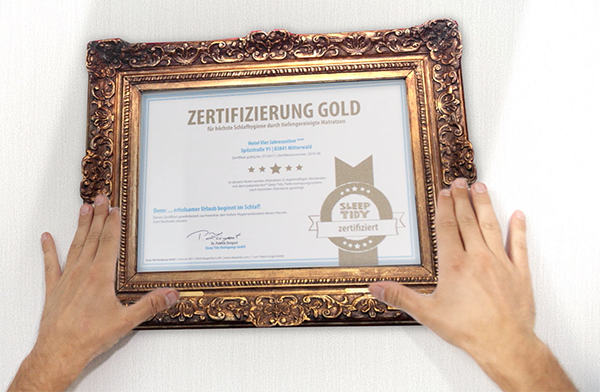 The SLEEP TIDY Certificate serves as a truly appreciated decision-making aid. Maintain the SLEEP TIDY Certificate and signal to your guests that your business values high hygienic quality. Our web-portal offers your future guests the opportunity to search specifically for certified hotels and accommodation facilities – for more profound booking decisions in your favor. Your mattresses will be labeled with “SLEEP TIDY – Seal” identification stickers and guests can access information about the valid certification online (via QR code), at any time. Good night, sleep tight, don´t let the mite bite!